Rafael Nadal is a Spanish professional tennis player who has won 13 Grand Slam titles as of 2013. Eight of his thirteen titles have come on clay earning him the title, ‘King of Clay’. He has achieved the career Grand Slam becoming the youngest to do so. He has been part of four Davis cup winning teams. He has won a Grand Slam in nine consecutive years making him the only player in tennis history to do so. He has also won the 2008 Olympics Gold Medal in the singles category. 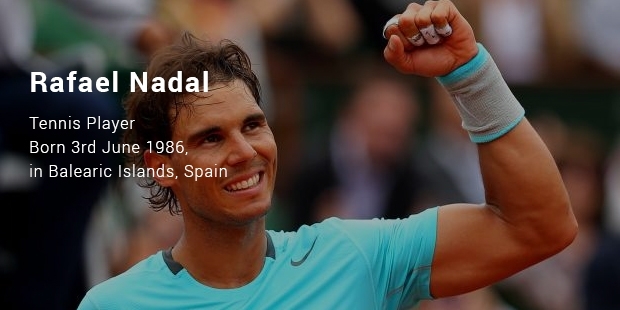 Rafael Nadal was born on June 3, ?1986 at Manacor, Spain. 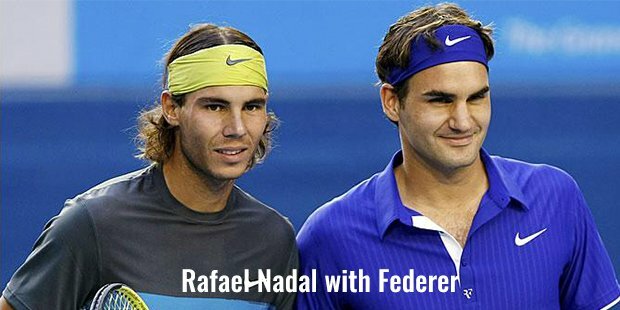 His uncle Toni Nadal who was a former professional tennis player introduced Rafael to tennis at the age of three. Rafael was good at both football and tennis. It was a difficult choice to make for the young boy. Rafael won the U-12 regional tennis championships at the age of 8. 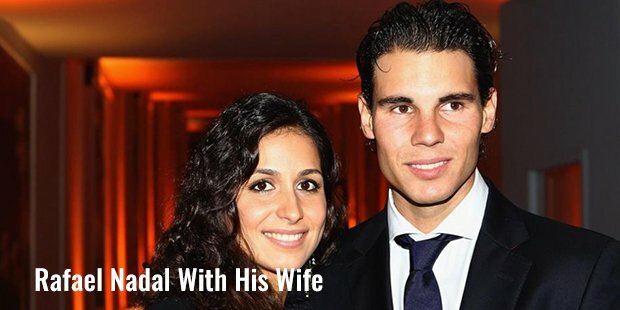 Now Rafael decided to choose to dedicate his time and energy to tennis and stopped playing football immediately. He uncle intensified his practice and taught him the various aspects of the game. Soon he was a consistent performer on the national circuit. Rafael got an invitation from the Spanish Tennis Federation for a scholarship and better training facilities. But his uncle believed that practicing at home would be the best option for young Nadal. His father had to bear all the expenses for training and coaching Nadal at home. Nadal chose to turn a professional at the young age of 15. He participated in many junior ITF events and produced impressive results. In the year 2005, he stunned the entire world when he became the first person in 20 years to win a Grand Slam in the very first year of participation. He was just 19 years old at that time. He had a long and successful future lying ahead of him. Many were predicting that he would go on to become the highest Grand Slam winner in the time to come. The world was stunned to see his dominance of the clay courts. His physical abilities were unbelievable. He would keep on extending the rallies until the other players were tired and fell into the trap of committing an unforced error. But critics were questioning his playing style and doubted whether he would be able to continue without an injury for a long time. Even his audience had doubts that his energy would run out or he would be injured due to the high-intensity game that he played. He proved his fans and critics wrong time and again by giving spectacular performances where he pushed himself to the limits. He has been frequently prey of knee troubles and injury lay offs. But his comebacks have been spectacular. He has bounced back time and again to dominate the sport for long periods of time. In 2007, he had an 81 match long winning match streak on the clay surface. He has also won 26 Masters 1000 titles and 14 Masters 500 titles. From dominating a single surface now Nadal is unbeatable nearly on every surface. He went on to win French Open 8 times, Wimbledon, U.S. Open twice and the Australian Open once. Now he is aiming to break the 17 Grand Slam mark set by compatriot Roger Federer. It is difficult to imagine how many more Grand Slam titles he is going to win in the coming years. He has established himself as one of the best tennis players to have played in the Open era. He has earned more than $60 million in prize money itself. He has become a huge fan favorite in Spain, his home country. He has been the recipient of various sports honors including the Laureus Award and the Epsy Award. He has been known as the one who gave his everything on the tennis court. His will always be remembered for the immense success he achieved with his ‘Never give up’ spirit.